There are many questions to consider when selecting a new garage door system: Which opener model to go for, what door material to choose, and whether to opt for added insulation or not. These might be considered the big decisions, but the smaller ones matter too. In some way or another, most of the decisions you make concerning your door can make a difference when it comes to efficiency and safety. The devil is in the detail – read on to learn the things our team at Garage Door Repair Bothell thinks it's important you don't miss! Whether you have glass doors or only window panels, selecting the perfect frames to fit them is very important. They must be strong, resistant and well-sealed. Aluminum frames come recommended as they are durable and tend not to warp. Insulation is important as you don't want to compromise energy efficiency by allowing air to escape through poorly insulated frames. Weatherproofing is another way to ensure your door is properly insulated. Properly applied seals can help to ensure no unwanted dirt, leaves or water work their way into your garage. In particular, it's important to give special attention to the bottom seal since a gap here can leave your door exposed to small animals and weather. If you're living in an area prone to extreme weather like hurricanes or thunderstorms, we strongly recommend you confirm that your garage door can withstand the elements and complies with the building code regulations of your area. For areas susceptible to strong winds and rain, we recommend considering 24 gauge steel for your door as well as reinforcement. If your door is missing these important cables or they are considerably worn, we recommend installing new ones as soon as possible. These components will keep your door from crashing down in the event that your springs give way. Don't get nylon garage door rollers if the door is extremely heavy because they will break easily. It is really important to ensure your door's release rope is reachable and works properly. This feature exists for use in the event of an emergency, as its name suggests. It won't be much help if it doesn't work or if you don't know where it is and how to use it. It's important that you at least read the owner's manual to ensure that you're ready just in case you have to pull the cord. Have some questions about anything mentioned here? Something wrong with your door and you need some help? 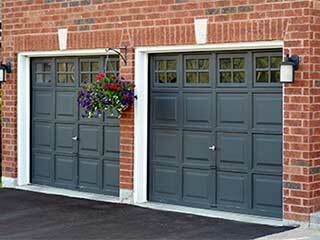 Contact Garage Door Repair Bothell to get an expert come over today and assist you with whatever you need.